Make disciples/followers/imitators of Christ (not just professing Christians). Baptizing them, so they can declare public identification with the Father, Son, and Holy Spirit. Teach them all that Christ taught the original eleven disciples (as recorded in Scripture). Teach them to observe/practice/do those things (not just to understand them). This is a weighty task. The eleven disciples felt it, so Jesus assured them: “I am with you always, to the end of the age.” He also defined the context in which disciples are made: the church. And He gave a special promise to His church: “I will build my church, and the gates of hell shall not prevail against it” (Matt. 16:18). No other institution receives such guarantees. This is why our ministry in Malawi is making disciples through the local church. We believe there is no better way to carry out the commission Christ gave to His followers. Practically, we describe our role as church-strengthening. Looking at the gifts, desires, and training that God has given us personally, we believe that we can employ them best in areas of administration, counseling, teaching, and service. For the unbelievers we encounter, our desire is that they turn from sin and believe in Christ. We see every interaction we have with non-Christians as an opportunity to give testimony to God’s saving grace. It is a great joy to see new disciples made as people put their faith in Jesus. For the Christians in our church, our desire is that they are equipped for the works of service (Eph. 4:11-12). We equip them by teaching the Bible as God’s perfect Word, and helping them practice it in their lives. Our hope is that all the ministries of our church—worship services, Bible studies, Sunday School, fellowship times, outreach and service, and more—would help the believers in our church to better live lives that please God. As our church members grow to love and obey Jesus better, we have more opportunities to call others to do the same, both in and outside the church. We aim to provide opportunities for them to proclaim the gospel to others, and to demonstrate the compassion of God so that unbelievers see our good works and glorify our Heavenly Father. We believe that if we disciple the people in our local church faithfully, the impact will extend far beyond this one church. We are grateful for opportunities to send members from our church to strengthen other churches. 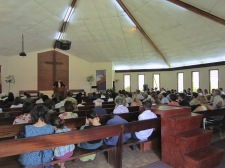 Matt also is involved in training and equipping local pastors at Central African Preacher’s Academy. Ultimately, our goal for the future is to work ourselves out of a job, having entrusted our ministry to godly leaders who will faithfully shepherd the church across Africa according to the Word of God.